Not everyone loves the way chain link fencing looks. But one thing you’ll never hear anyone ever say about it is that it doesn’t do its job. That’s because chain link always does its job. It just works. It’s the no-nonsense fencing option that’s always available when you need quality. Reliable fence without spending an arm and a leg. Here at Nashua Fence Installation, we’re very familiar with the types of chain link fencing and the options available. After spending years of installing it you would be too. 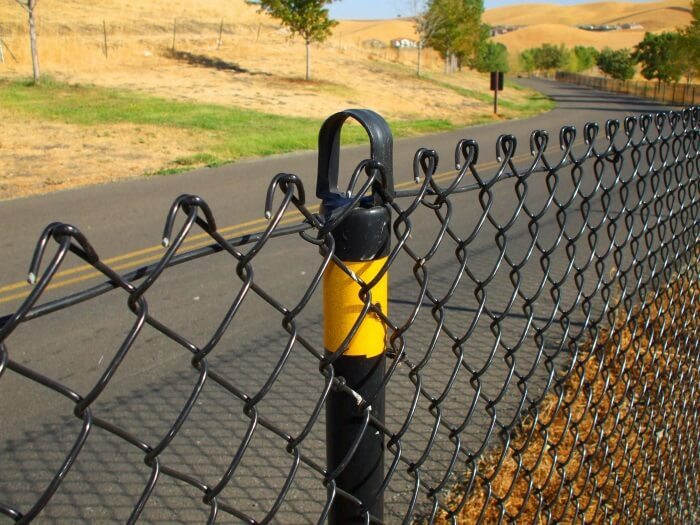 You’ll be surprised how strong the chain link material we use. And when it gets installed quickly, efficiently, and affordable, you’ll be delighted with this incredible fencing type. Now, it’s not just utility. Chain link won’t win any beauty contests but when installing properly. It can look quite nice. If you’re looking for a quick but reliable fence that won’t break the bank, you can’t go wrong with this one. Some of us want to keep animals in our yard and some of us want to keep animals out of our yard. But either way, the chain link is one of the most reliable ways to do so. If you own a precious dog, cat, or any adorable pets, it would be horrible for it to run off and get lost. Pets are wonderful, but let’s face it, they don’t always have the most foresight. An opportunity for adventure will have them so excited they won’t even think about how to get back home. Thankfully, a chain link fence is one of the best options available. Cheap, fast, effective, and they last forever. You’ve probably experienced having a strange dog or animal show up in your yard before. Sometimes they can be friendly, just looking for a bite to eat, and other times they can be aggressive and feral. If you have a garden, you’ve probably experienced pests getting into it and digging things up. These are problems that you can avoid by having a clearly establish yard space that prevents other animals from getting in. After all, the last thing you want when letting your pet out is for another animal to threaten them or for them to be exposed to any feral diseases. Chain link fencing is a great way to secure your yard quickly and affordably. A fence of any kind is a clear statement of a border, and for legal reasons, whether you’re concerned about safety or security, a fence is a great thing to have. You’re making a statement and sending a message: this home is secure, this property is owned and cared for. A good fence can be a tough deterrent no matter what you need them for. If you have any questions or concerns about chain link fences, fencing costs, or would like a free quote, please give us a call at your convenience. Our phone number is available above and below, and our contact information is conveniently available all over this website. Whatever your questions are, we will be happy answer them and give you all the information you need. We take a lot of pride in our fences and are confident you’ll love yours too!